Aqua Rite provides complete pool & spa sanitization using ordinary salt. It’s extremely safe electrolytic technology uses a low-voltage electrical charge to convert a small amount of salt – approximately one teaspoon per gallon of pool water – into a virtually endless supply of fresh, pure chlorine. This environmentally friendly and self-renewing process produces up to 1.45 lbs of chlorine a day, enough to keep the water in a 40,000 gallon pool clean, clear and luxuriously soft. The Aqua Trol chlorine generator is designed specifically for the above ground pool. 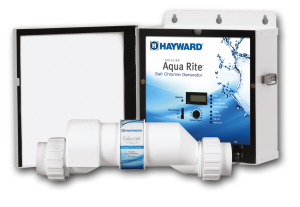 Your pool’s water quality will be unmatched with the Aqua Trol System. Now you can have crystal clear, silky smooth water at an affordable price. Our Aqua Trol chlorine generator takes a low concentration of common salt in the pool water and converts it into chlorine without all the harsh side effects. No more red irritated eyes, dry itchy skin, or chlorine smell. 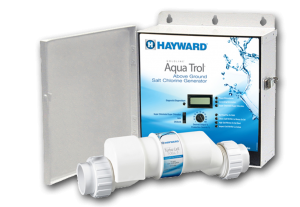 The Aqua Trol has a built in time clock that allows you to control your filtering time and your chlorine production saving money by reducing filtering costs and minimizing buying chlorine. It couldn’t be any easier to own a pool! 2 cell mounting options “RJ” models mount the cell directly to the pool return jet (on the outside of the pool) “HP” models include fittings for hose or PVC pipe connections.